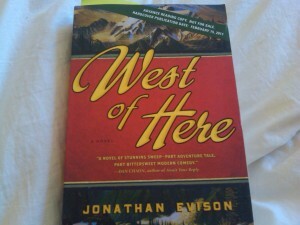 The advance galley boxed set for Jonathan Evison's new novel, "West Of Here." I opened the packaging to find a pine box that looked for all the world like the kind that high-end salmon distributors use to send out gift container of vacuum-sealed smoked salmon. As much as I love smoked salmon, what was inside this particular box was much better. It contained a series of old-style postcards and maps spotlighting Port Bonita, the fictional setting of Bainbridge Island author Jonathan Evison‘s coming second novel, West Of Here. Oh, and an advance paperback proofreading copy of the book itself, even though the finished version of West Of Here, which will be released in hardcover, won’t be available in bookstores until Feb. 15, 2011. 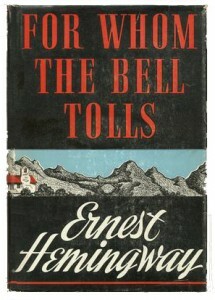 The galley box was the brainchild of Evison and the marketing folks at Algonquin, his new publisher. It’s in an effort to whip up plenty of pre-release interest in Evison, who is being pegged by his publisher as a literary talent poised for a breakthrough even bigger than the one he got from his knockout debut novel, All About Lulu. And the folks at Algonquin are putting their money where their mouths are, preparing for a first-print run of 75,000 (Lulu‘s first printing was just 10,000), and sending the author on a cross-country tour of the publishing industry’s book fairs and festivals this fall. That’s all ahead of a 21-city, 25-day tour after the book’s release date. 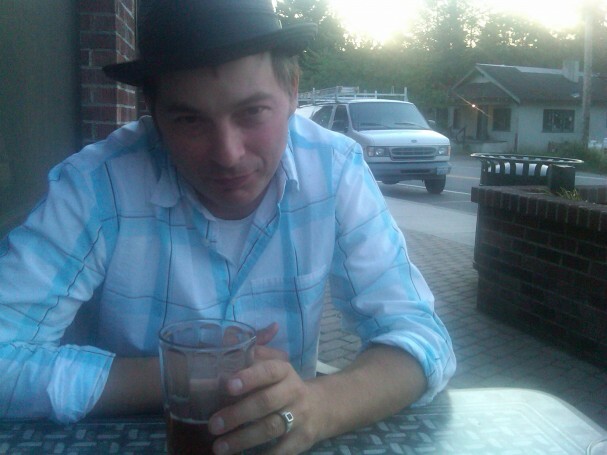 “They believe in me, I guess,” the 41-year-old Evison told me recently over beer and pizza at The Treehouse on Bainbridge Island. It’s nice to see at a time when cost-conscious, risk-averse publishers are generally doing less for their authors. And nice especially since West Of Here is a radical departure from the coming-of-age tale in 1980s Southern California that made Evison’s name and fame to date. It’s a novel of epic sweep, encompassing parallel narratives set in 1889 and 2006, and rooted in the hardscrabble reality and inscrutable mythology of the Olympic Peninsula. 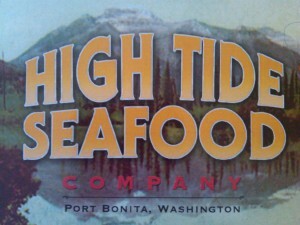 (Port Bonita is essentially Evison’s stand-in for Port Angeles.) I’m only 60 pages in so far, but I can tell that West Of Here is storytelling grounded in years of Ph.D-level research of the area, the history, the people, the culture and the land. 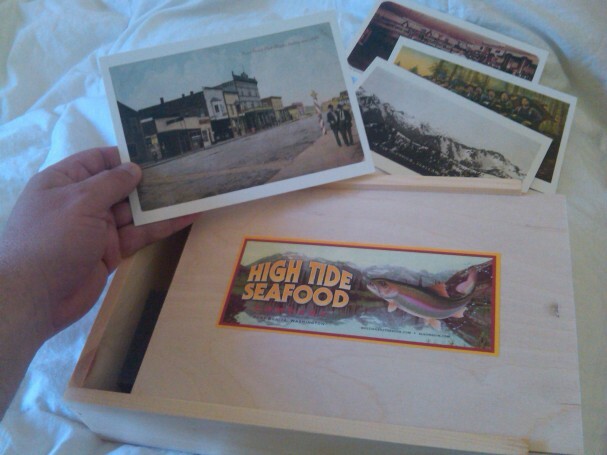 All that’s evident in the contents of the box, which were inspired by vintage postcards and other art of the time. And the cover itself, which harks back strongly to the style of the great novels of the 1920s and 1930s from Ernest Hemingway and John Steinbeck, among others. All that is the longwinded way of saying what I said in the title line of this post … which were the same words I uttered when I opened the package: “This is the coolest thing ever!” All befitting one of the coolest authors ever (in my experience, anyway). Which reminds me: Thanks again for the beer and pizza, dude. Pizza, beer and that cool box?! I’m jealous, Jim!
. . . hey, thanks for this, jim! . . .full credit for conceiving the boxes goes to the genius of craig popelars and the algonquin marketing team (including katie ford) . 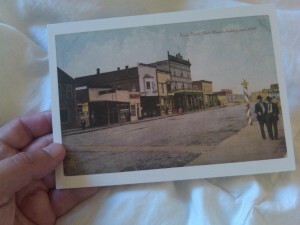 . . my contribution was rooting around antique malls looking for cool vintage postcards and stuff . . . also, convincing them to produce a retail version . . .
Can’t wait til I am watching you win the National Book Award, Evison. Remember when….